Lexa Walsh runs a micro-funding dinner series called Oakland Stock that supports artists by selling soup. Sarah Burke Artists present their projects to attendees, who then vote on which one they'd like to fund. 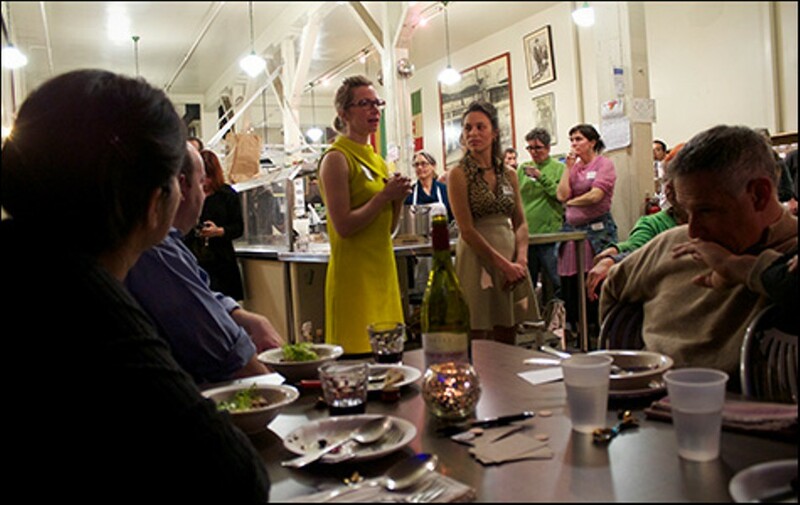 On January 26, a group of fifty hungry art enthusiasts crowded into Ratto's International Market in Old Oakland for a special kind of dinner. It was the third installment of Oakland Stock, a dinner series that supports East Bay artists via micro-funding. The diverse group of attendees sat together at tables, drank wine, and chatted excitedly about the presentations that were about to begin. 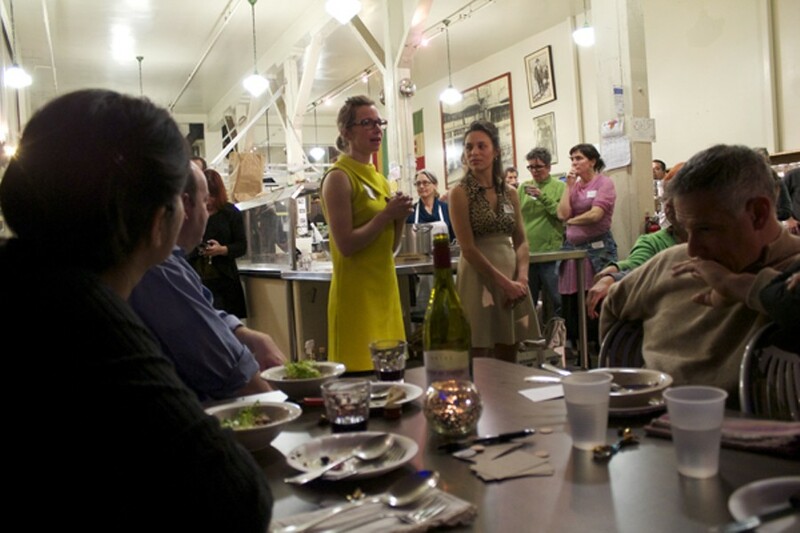 Each attendee had paid $10 for the gourmet dinner, which consisted of soup and salad. During the meal, local artists — including an abstract sculptor, a pair of letterpress artists, a filmmaker, and a theatre troupe — presented proposals for projects that they hoped to get funded. Afterward, diners discussed the proposals amongst themselves and with the artists, then voted on the project they wanted to fund. The winner, Suki O'Kane, went home with $500 (the sum of the entrance fees) to go toward her project, Mailbox Cinema, and will return on April 27 for the next installment to report on her progress. Oakland Stock is one version of a Sunday Soup series, which was first started in 2007 by a group of artists in Chicago called InCUBATE. Since then, 91 other iterations have popped up in cities around the world, according to the Sunday Soup website. Artist Lexa Walsh was formerly a guest chef at the Portland-based series, Portland Stock. She decided to bring the phenomenon to Oakland in hopes of cooking up discussion around art. Walsh was given one of Southern Exposure's 2012 Alternative Exposure grants in order to fund the first few rounds of the series. The money covers the cost of the dinner so that all of the entrance fees can go to the artist. Eventually, Walsh hopes to find a bigger venue so that the audience can grow and the event can sustain itself financially while also offering a larger sum of money. Walsh knows that $500 isn't a huge amount, but it can make a significant difference to artists. All kinds of artists are welcome to participate, but those who work on a local scale and have non-commercial, experimental ideas are most likely to find the event appealing. Part of the reward is simply participating. "Even if you don't win the money, you still got a great meal .... You got to meet a bunch of new people, share your work with them, and have a good time and practice talking about your work, so I think it's a win-win situation," said Walsh. Walsh herself is a full-time artist, and is currently doing a fellowship at the de Young Museum in San Francisco. She practices socially engaged art that focuses on bringing people together to converse and collaborate. Her projects take various forms, including group songwriting sessions, facilitated conversations over home-cooked meals, and recipe exchanges. "It's sort of like public art, with people, by people, about people," said Walsh. She also runs Librarification.Tumblr.com, which lists funding opportunities for artists. She believes that artists should support each other rather than create competitively. Although Walsh recognizes that Oakland Stock takes the form of competition, she sees it as positive because it works to build relationships and spur productive dialogue not constrained within the artistic sphere. "It's about communities choosing what's important in cultural production, and making that transparent," she said. In order to participate, artists only need to prove that they are capable of presenting their idea. Other than that, the spots are first come, first serve. Walsh organizes the event, but it's up to the patrons to decide what project to fund. "The diners, they are the audience electorate, they are the community, they decide what's important," said Walsh. "There's something utopianly democratic about that vision." O'Kane also prefers collaboration over competition. Although she reluctantly competed, she ended up leaving the event not only with money, but with a list of new acquaintances who wanted to be involved with her project. "All the artists that I met that night had an insight into what would make my project better, and that was the coolest part of Oakland Stock," she said. O'Kane's project, Mailbox Cinema, involves outfitting a mailbox with a small screen and tiny computer that automatically plays a film when a motion censor detects an audience. O'Kane plans to work with community members to decide where to place the mailbox, which she hopes pedestrians will stumble upon. The film will be created by a local artist chosen by O'Kane, and will focus on the history of the particular spot that the mailbox is located, giving passersby a new perspective of the area. "My experience, like Lexa's, is community curatorial, and I feel like if I can get these mailboxes to work, they have to have a lot of voices in them," said O'Kane. Those voices aren't meant to be just those of artists, but also of the broader Oakland community. "I think that some of the most powerful stuff happening in the East Bay right now is ... projects that are self governed by artists, which allow audiences to join them in the practice of creative observation," she said. Although Walsh doesn't necessarily consider her facilitation of Oakland Stock to be artistic, her work has a certain degree of similarity to O'Kane's. Walsh hopes to bring East Bay residents in direct connection with the art being created in their communities, rather than simply viewing it in a gallery. She hopes to involve them into the creative process through constructive conversation and direct patronage. "Sometimes it seems really random how art gets supported, and I feel like there is a transparency about this that is really refreshing because we're all there voting on it together," said Walsh. "This is a chance to make this process really open and to create conversation that needs to be had." Culture Spy Oakland Stock Lexa Walsh Suki O'Kane InCUBATE G.B. Ratto's & Co.